Royal Masonic School chose to match their tray storage to the contrast edging on the cabinets. Opting to have single and double trays to allow for simple flexible storage that matches the surroundings. 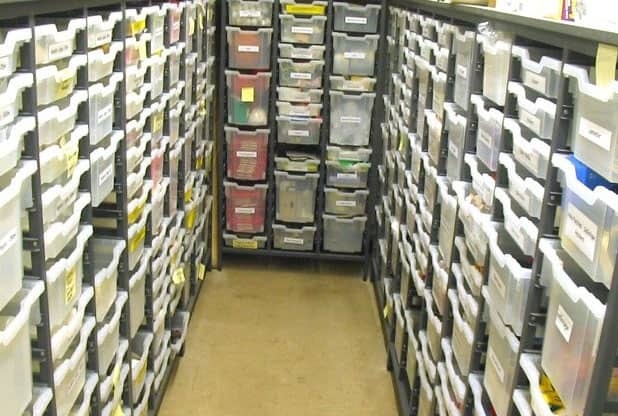 The Co-op Academy chose to have a shallow tray storage unit and label each tray individually, making it easy to identify the contents and keep equipment in its place. St James’ use both light and dark blue single and double storage trays. A lime contrast edging for the cupboard doors makes the colour pop. They use detailed printed labels, to indicate for example the size and type of beaker. In this area of the lab the secondary school chose yellow single plastic trays. They also use colour to make an important tray stand out. Your eye is drawn to the red tray. This can be used to your advantage to indicate the most used or most important trays. Trays are used to maximise storage space at Robert Bloomfield where they are incorporated into their serviced bollards. 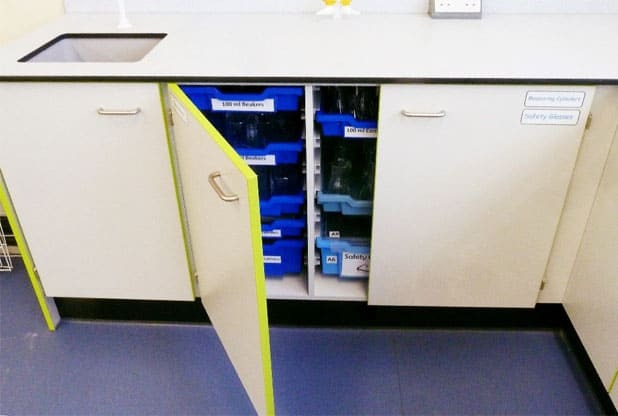 This is a popular use of trays and allows you to have a more flexible lab with optimised space for school storage. 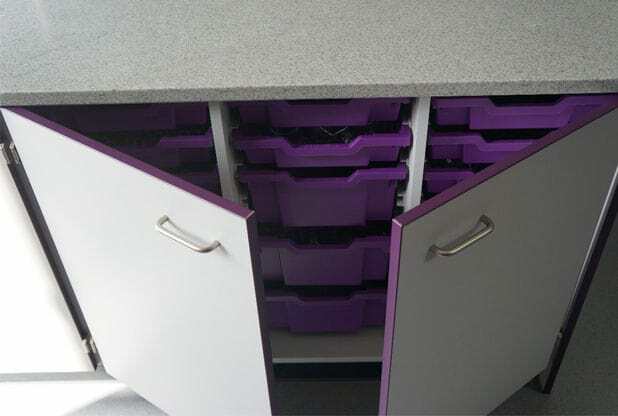 Robert Bloomfield Academy also maximise the space in their prep room by lining it with multiple sized trays to allow for flexible storage. The department selected transparent plastic trays making it easier to see what the trays contain. Contrasting colours create a vibrant look and can also be used to differentiate tray contents. For example here, purple is used to store equipment and lime is used for stationery. The trays also have clear lids making them more portable and multifunctional, with contents easily indentifiable. 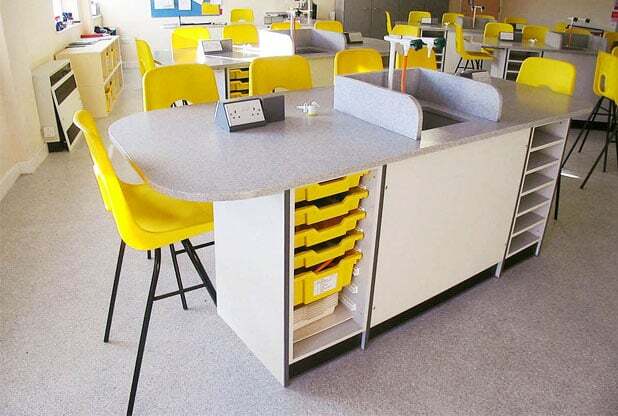 Cadogan House School also added tray storage to their oval island units. Quad Gratnells trays are used here which are ideal for storing larger items. Their size also means they can be used to gather all the items required for one lesson and carried around the classroom. 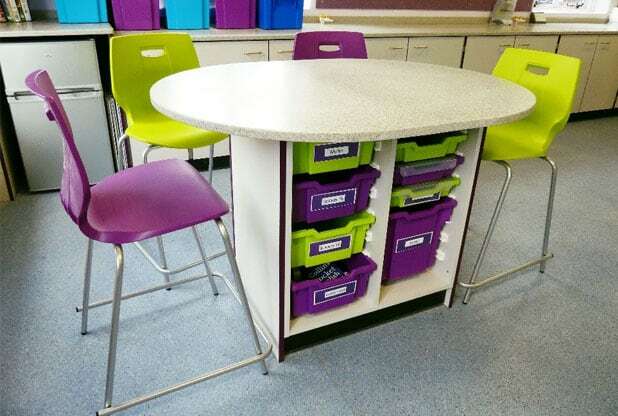 The quad trays are seen in use on the work surface at the back of the classroom. The staff at Peterborough chose to split this teaching wall space between display and functional tray storage. The addition of the glass doors helps keep items dust free. We hope this has inspired you to organise your own tray storage. 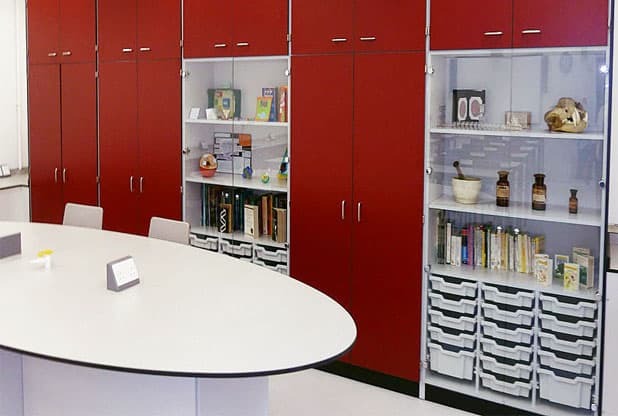 Subscribe to our newsletter for exclusive offers and even more storage solution ideas. 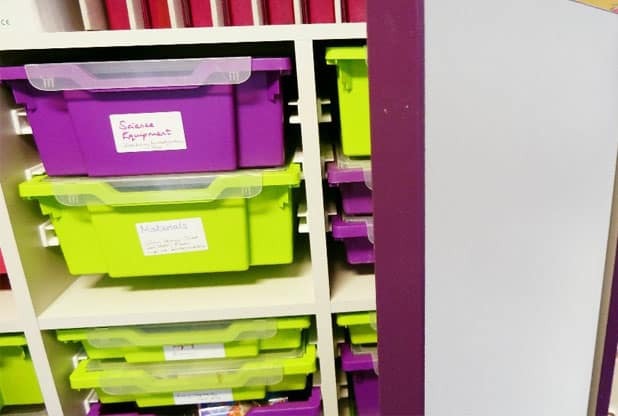 If you would like to know more about our storage solutions and the trays we offer please call us on 0161 998 9726 or email us at sales@klicktechnology.co.uk We would be very happy to help. Lets get a little more organised!